South America is a place full of stories about mysterious beasts. Standing seven feet tall, with long red hair and big sharp claws, tales of the mapinguari, have been passed down in South American Indian folklore. An odd tapir/jaguar hybrid is also said to lurk in the deepest parts of the Amazonian rainforest. Although extremely fanciful, this hasn’t stopped explorers searching for strange creatures. Even explorers who also happened to be vice-presidents. The principal author of the American Declaration of Independence, Thomas Jefferson had a strong interest in the sciences. He was a member of the American Philosophical Society for 35 years, and promoted the sciences widely. In 1796, when he was the vice president of the United States, a Colonel sent Jefferson some bones, including massive claws. He thought they belonged to an enormous lion, and, because the bones looked so fresh, thought that the lion was still out there. So he asked two explorers to keep an eye out for his giant lion. Surprisingly, the explorers didn’t find anything. His giant lion, which he named Megalonyx, was in fact a giant ground sloth. Some years later it was named Megalonyx jeffersonii in Jefferson’s honor. However, there are some very strange things lurking in Southern Brazil and Argentina. Bizarre structures that would have made Jefferson venture into the jungles himself. South America is riddled with burrows. Not your normal burrows from the lovely looking rodent, the paca, or the wonderful armadillos. These burrows are enormous. They range from about half a meter wide (large enough for me to crawl inside) to around 4m wide (large enough for a car to drive inside!). What’s even more amazing is these burrows are not in the soil; they have been dug into rock! Sedimentary rocks, with their relatively softer, looser grains seemed to be a popular choice, but burrows have also been found in weathered (so slightly softer) igneous and metamorphic rocks! Someone, or something, has been digging pretty big tunnels. These giant tunnels have been known about for thousands of years: there is evidence of paleo-Indians using them in the past, and an inscription in one dates to 1878. Many burrows have had their entrances modified by humans (but interestingly not the insides of the tunnels). Amazingly, we can tell what marks are recent in these tunnels, because the walls of the burrows are coated with a thin mineral crust, or sometimes a thin clay. Marks made when the burrow was first dug have this coating covering them, more recent marks on the walls scratch off this layer, revealing the fresh looking rock beneath. The makers were not humans. As the Spanish discovered very early to their advantage, South American Indians didn’t use metals, so digging into hard rock would have been very difficult. What’s more, the roofs are incredibly smooth. Very, very smooth. Unlikely that they were smoothed by human hands. But could they have been formed by water and in fact be natural caves? 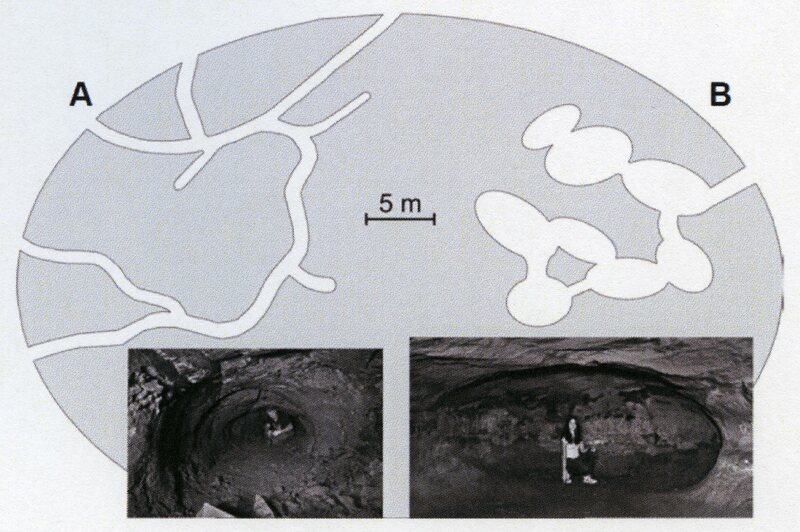 There are some small gouges on the floor of some tunnels, formed by water leaking in through the roofs, but no evidence that these were formed by water running underground. The structure of these giant structures is all wrong compared to other water formed caves. Some intriguing clues provide an answer to how these strange tunnels formed. The roofs are all very smooth, as you now know: a polish that could only have come about from something continually rubbing against the rock. Similar features in caves have been seen in Europe. In certain parts of the cave, generally where the passageways are fairly tight, the sides are unbelievably polished. This is known as Bärenschliffe, and is caused by thousands of generations of cave bears passing through and rubbing against the walls. With the roof of the tunnels polished, this indicates that something very big in South America was making and using these tunnels. Not to mention the claw marks discovered in some tunnels too. There were some big beasts in South America during the Pleistocene; the odd trunked litoptern, Macrauchenia, the chunky weird-looking Toxodon, some pretty big ground sloths (Megatherium, Glossotherium and Mylodon), and enormous armadillos (Glyptodon, Pampatherium, Holmesina, and Propraopus). 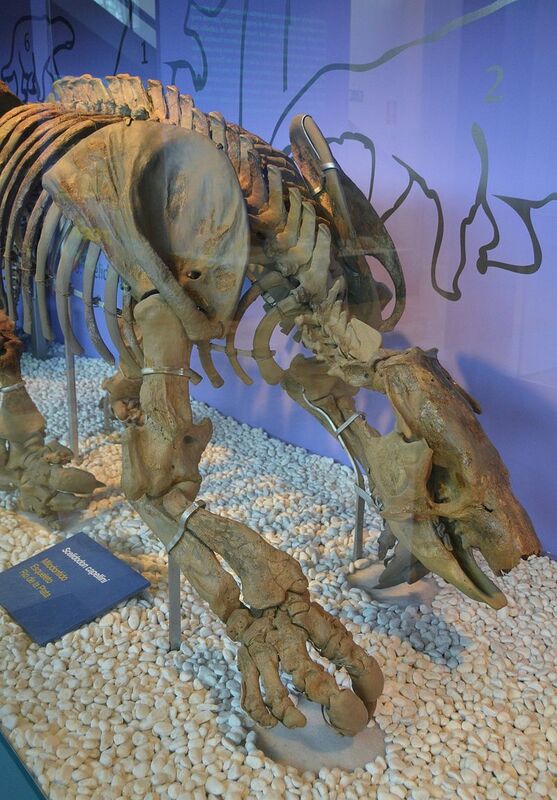 Only the giant sloths and the armadillos had the anatomy for digging, with their big, sharp claws. Animals digging burrows will remove enough sediment so their bodies will fit in. (A badger’s tunnel just fits the badger: removing more sediment than is needed wastes energy, and also opens it up to predators.) Some of the tunnels in South America which are around half a meter wide were dug by the giant armadillos, similar to armadillos digging today. (Interestingly, the enormous armadillo, Glyptodon, appears to have lacked the adaptations for burrowing, with it’s short, inflexible front limbs, and fused vertebra). The size of the larger burrows indicates these were dug by giant ground sloths: Glossotherium and Scelidotherium in particular. Analysis on their arm bones show that these two species were well adapted to taking the strains of hard digging: short, robust bones. Initial examination of the enormous ground sloth, Megatherium americanum arm bones suggests that this giant couldn’t take the strains of digging. What’s more, Giant sloth claws were enormous! One claw is longer than my hand! If you grab a stick and scrape it on sandstone, you will notice grains will fall off. (Being soft, the stick itself will crumble pretty quickly). Now imagine if you had giant ground sloth claws! With over 1,500 of these palaeovertebrate burrows documented so far, this was clearly an important part of the lives of some species of giant sloths. It turns out that they are more complex than just a little tunnel. Many have been found to connect with other burrows, and some have several openings, creating pretty impressive underground systems. With lengths of over 300 meters, they were not dug by one individual. They may have been dug by groups of sloths, or even extended by several generations digging a little bit more out in their lives. 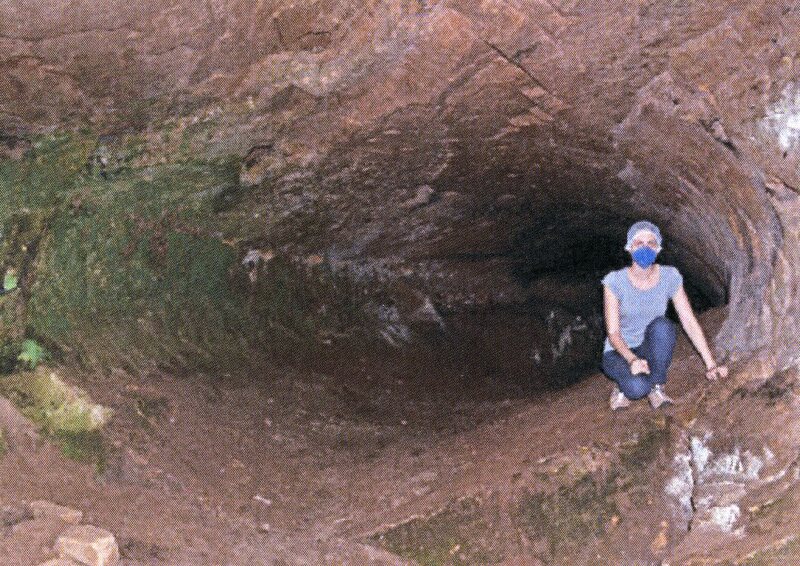 Recently, some massive palaeovertebrate chambers were found in Brazil. And these were large, and complex, with several underground chambers. When we try to make sense of the past, nothing is ever clear cut as it first seems. It appears there were at least two styles of burrows: the tunnel based systems, and the chamber based systems. Both of which were very complex underground systems. Oddly, we don’t know what the burrows were used for. All of them had their entrances close to waterways. Some researchers suggest they were to hide away from the big predators Smilodon and the short faced bear, Arctotherium. The entrances were much too big to prevent these creatures from sneaking inside. 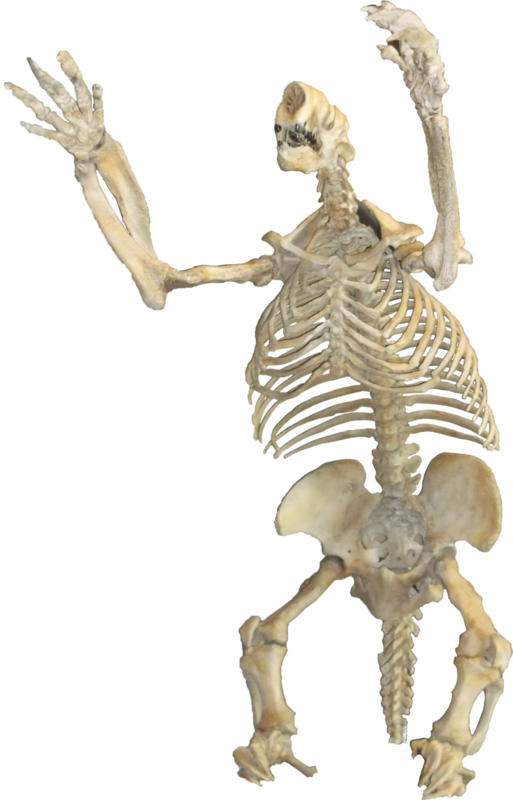 Others propose that the giants were using them during periods of cold or drought, which is likely, but the sloths wouldn’t have been able to dig them out in time to protect them. One suggestion by our very own Ross was that they were actually love tunnels, where the sloths used these tunnels in relative safety to mate. I quite like this idea. It fits nicely too, because all of the tunnels so far excavated lack any evidence of occupation: no dung, no debris from food, and no fossils. (Only one tunnel out of the 1500 or so discovered has a sloth skeleton trapped in volcanic ash). Each new discovery of a fossil, or a trace fossil, adds so much to our knowledge of the complexities of species lives. Without knowing what has been lost, we struggle to appreciate how incredible each individual animal is today. And how fragile our world is. This entry was posted in Giant Ground Sloth and tagged American Philosophical Society, Arctotherium, Armadillo, Cave bear, Glossotherium, Jan Freedman, Macrauchenia, mapinguari, Megalonyx jeffersonii, Megatherium, Megatherium americanum, Mylodon, Mylodon darwinii, Paca, Palaeovertebrate burrow, Scelidotherium, Smilodon, Thomas Jefferson, Toxodon. Bookmark the permalink. Wow, this was really interesting. I really had no idea such tunnels in rock existed. If I were shown that first image I would have assumed it was a lava tube. Any idea how long it would take a sloth to burrow through rock. It feels like a muti-generational thing to me but the selection for such a complex behavior is hard for me to imagine. Very cool post. I had no idea ground sloths made such enormous burrows, and in rock! If giant ground sloths moved as slowly as modern sloths, then it must’ve taken forever to dig those tunnels. I think the burrowing behavior explains how Jefferson’s ground sloth survived cold climates as far north as Alaska. The edentates have primitive thermoregulatory systems, but this species could take refuge in burrows it dug during cold seasons. They possibly remained inactive in their burrows for part of the year. Wow, truly mind expanding article. I have a much increased respect for ground sloths! Interesting piece, thanks for the read! One more reminder of what an extraordinary place this world is. Tunnelling ground sloths. So cool. Is the recent classification of glyptodonts as nested within the armadillos, as opposed to being closely related, settled, then? Just curious- from what little I can dig up (pun intended) the genetic research is very recent (2015/2016), so interested in the debate about this decision. I think it is pretty settled now. There had been some reanalyses of the morphological data which hinted at the possibility. And the DNA seems to now confirm it. Mind officially blown. Good job. We have identified so far smaller burrows (about 1m in diameter), probably produced by giant armadillos such as Propraopus, Pampatherium or Holmesina, and much larger ones (up to 4 meters in width and 2 meters in height). We are not sure yet about who produced these larger burrows, but tentatively consider giant sloths, including Lestodon and Glossotherium, as the most likely candidates because of their huge size, compatible with that of the structures (assuming that no burrowing animal produces tunnels much larger than their body height/width), and because both have arm and hand morphology that would allow for such strenuous activity. The general morphology of the digging marks, formed by 2-3 parallel grooves, also matches the morphology observed in the hand of those sloths. Hi Renato! Thanks for the extra information and links! Fascinating work.